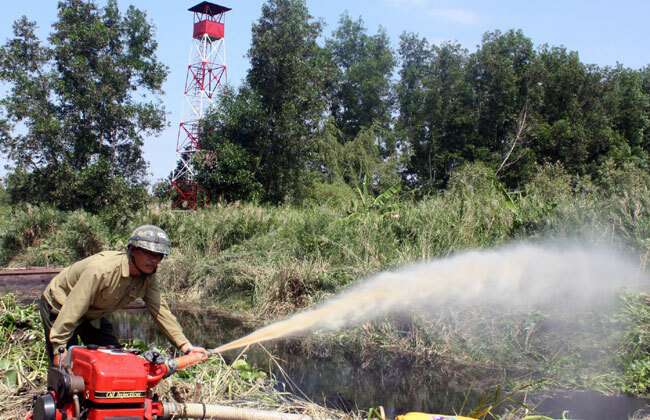 HCM CITY (VNS) — The 8,527ha U Minh Ha National Park in the southernmost province of Ca Mau is facing increased threats of forest fires, according to the Ca Mau Sub-department of Forest Protection. Nearly 6,500ha of the park are currently on a level three warning and more than 1,500ha are on level four. This may even rise to the fifth and highest level, in the coming months of the dry season. Prolonged heat and strong winds since the start of the year have meant the water in the canals of the park's cajeput forest, have dried up. Because they grow on peat land, fires in cajeput forests pose a serious threat. Peat is particularly flammable, so any fire would spread quickly and be difficult to extinguish, according to the Ca Mau sub-department. The park authorities have improved measures to prevent forest fires, which has included building two large dams and 20 sluice gates to hold water for extinguishing fires should they start. The park has also built and repaired 28 stations and 18 new monitoring towers, 11 fixed water pumps and set up two mobile pumps. The park has also completed building a 78.8 km road system, including 26.3 km of asphalted roads which give vehicles better access to the further reaches of the forest should a fire occur. Alongside this, they have arranged for staff to monitor the park round the clock. The board has advised that local people avoid entering the park to collect wood or honey, without permission as they may unintentionally start forest fires. It has also encouraged more local people to help prevent forest fires by signing forest protection contracts with them, in which locals are expected to manage and tend to parts of the forest.